All activities are optional, and retreatants are expected and encouraged to determine and honor your own spiritual needs. Morning Reflection ~ Each day after breakfast, one of our spiritual directors will offer a morning reflection focused on a particular spiritual practice. Spiritual Direction ~ Retreatants are assigned a spiritual director for the retreat and may spend up to one half-hour each day in spiritual direction. Vespers at 8 p.m. (sundown) closes each day. There are also practices to engage in throughout the day, as you choose. There is a labyrinth to walk. Art materials will be available in our main meeting room. The main chapel and meditation chapel are open 24 hours a day. 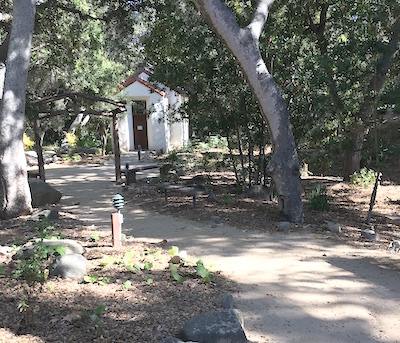 The meditation chapel is open 24 hours a day. Here is the daily schedule from the 2017 silent retreat. This is provided to give you a sense of the rhythm of the week and the diversity of offerings we hope to provide. There is no guarantee of which spiritual practices the 2018 schedule will include; the schedule will not be finalized until a few weeks before the retreat.